This ESL lesson plan contains activities, games and resources for teaching the present simple and continuous to intermediate level students (B1). The recommended way to view these materials is through the TEFL Handbook app, which gives you offline access to everything on the site. The sample board below can be used to compare and contrast the different functional uses of the present simple and present continuous. Step through each, explain the difference and elicit an example sentence. The text in blue implies opportunities to elicit responses from your students. a. What time do you start work? b. How many hours do you work a day/week? c. What are your main responsibilities? 2. What they are doing at the moment. a. What are you doing at the moment? b. Why are you doing that? 3. If they are happy with their job. a. Do you like your job?...Why/Why not? b. What would you change about it? Students take turns in each role while the teacher monitors for the correct usage of the present simple and present continuous. 1. What you and your friends are doing now. Encourage your students to be as imaginative as possible and let them read their emails to the class if they wish. Student A: Are you in the bedroom? Student A: Are you a bed? Student B: No, I’m not. Here's a collection of free teaching resources from around the web that can be used to teach the present tenses. 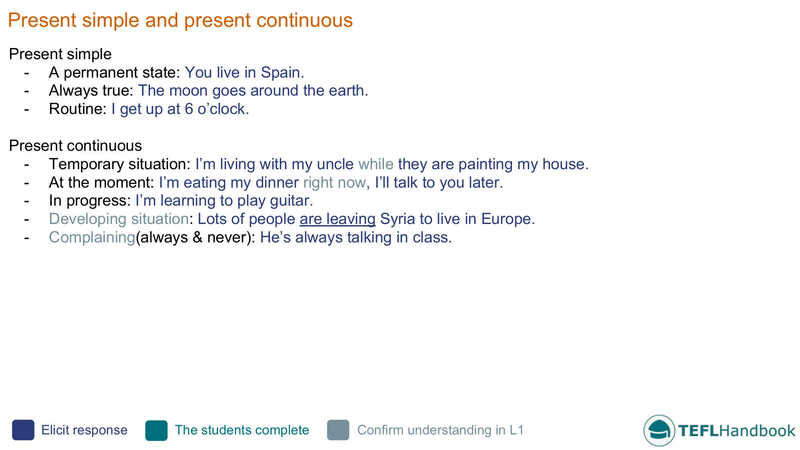 This worksheet on present simple vs present continuous from vpssa.edu.rs along with this from busyteacher contain a good variety of exercises that can be used to test your student's understanding the grammar. tefl.net have a fantastic list of ESL classroom activities for combining the present simple and present continuous. It's well worth having a look through these. For an alternative approach, check out this wonderfully detailed lesson plan from Danielle Gonzalez. There are some excellent notes on the Student teacher interaction. A fantastic resource for new teachers. Our suggested next lesson is on stative verbs. Be sure to check out our full list of ESL lesson plans for intermediate students, as well as our complete selection of EFL - ESL lesson plans. If you use an iOS or Android device, have a look at the TEFL Handbook app. An ESL lesson planner for English teachers. It has a lot more content and gives you faster access to our teaching resources, making it easier to use in class.